Anyway, I've started off small, and just done a few lines to journal on, but I rather like the outcome, especially with a few threads loose at the end. Thus! Lo! Other Declamatory Phrases! I scrapped the lens baby - finally. I loved the packaging so much as on the box, it said "Congratulations! It's a lens baby!". And when I opened the box, the leaflet peeped out the top with the word "Mama?" in soft cuddly letters. An instant page title was born. It's of the fisheye variety and I love it because firstly, I can fit whole chunks of London in the frame all at once without cropping bits of Nelson off. Secondly, it's virtually impossible to scalp anyone in a self portrait as the lens sees all. And finally, lovely soft focussy effects. Lush. Anyway, here's to many more machine stitched and fish eyed pages. Anyone got any good sewing machine tips for pages? Welcome to the blog hop challenge! A few weeks ago, I put out a call; I offered up little handmade embellishments in exchange for a promise. And I've been overwhelmed by the response. So without further ado, I cordially invite to you hop on board! I sent embellishments zooming (sort of) through the post to far flung places in Britain, Europe and even the USA! And in return, a whole host of wonderful ladies have put them to use in all sorts of fantastic crafting projects. To see their ideas and unashamedly steal their inspiration, you can follow through the list of blogs below. But first, I'd like to share my projects. I used my own embellishments as features on a couple of pages. I like to scrap with lots of bits and pieces in layers and so the embellishments made a great focus point for me. This page is all about recent trip to the seaside - I've already blogged my journalling here, and I spread it around the page in little blocks. I've found this to be a really helpful way to journal recently as I can get lots of writing on the page without having to find a big chunk of space to put it in. The embellishment clipped neatly onto one of the layers and I added a die cut from Sassafras underneath. I used the back of the die cut because the white really made the focus embellishment stand out. And partly because I really didn't like the front. Finally, I added a bit of hand stitching for detail. My second page is the same process, but I've kept the embellishment a little more subtle. It helps to add detail to the page and balances the design, so that there's an element in both the top right and bottom left of the page. I also really liked the way the blue in the embellishment matched the tones in the photo. I took this picture of cupcakes at a friends house after a slightly... shall we say interesting?...baking session. But they turned out quite tasty in the end, and we really went for it with the food colouring. Anyway, when I took the picture, the light was really bad and it came out rather bluer than intended. Because the cupcakes were green. But I loved the atmosphere in the picture and really wanted to scrap the memory of the weekend, and I tried to turn the blue to my advantage! If you get derailed from the blog hop at any point because the internet elves won't stick the right picture on your screen when you click on a link, you can find the total list of the blogs below. I really encourage you to have a look at some of the amazing crafting that these talented ladies have to offer! Alison of Ali T. S.
P.S. If all goes well, maybe we'll do the same next time I hit a blogging milestone. We're having a blog-hop extraordinaire tomorrow, so do pop by for some embellishment action! "So, we will get this assembly together somehow gents, even though there's no projector, and no computer..."
"...and...no....lights????? ARE YOU KIDDING ME?!!!!!!" You can't make things like this up. P.P.S. Check it out! Mug cosy in Beki's shop. *wants* I would be the envy of the staff room. Oooh, long time no blog! But it's been busy. First week back at school with all that entails, having a social with the guiders, which predictably went on all night (on a school night), squishing in a play at the National theatre and then, the crowning glory... The Last Night of the Proms! There's so much to tell about that night, and it merits a post in its own right (see: the future) but for now, I want to share a few pre-scrapping thoughts. Once I know what camera stuff I'm taking, I can make sure I've got plenty of battery life and memory card space and I know I'm going to get millions of pictures. And maybe a few great ones! Before any really scrappy stuff starts, I like to get my journalling down, while it's fresh in my mind. I often edit a bit afterwards, but I think it's always best for me when I sit down and type out whatever I happen to be thinking, the sooner the better. I have to type because my handwriting can't keep up with my thoughts. Next, I go through the pictures, choose the best ones and print. I print at home because that way I can do any size I like. 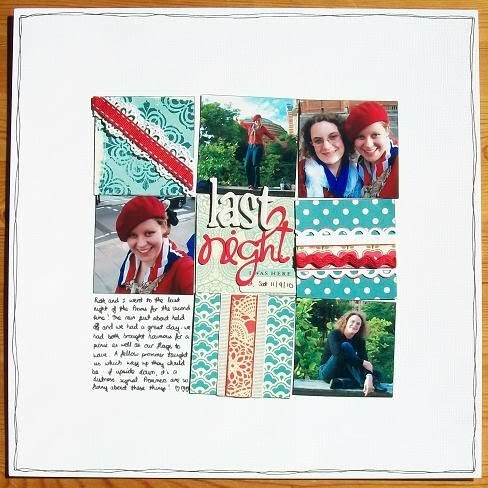 I do love photo strips if there are lots of pictures that are quite similar, and that can be great for scrapping. However, this year, I've got half a dozen or so that I really love and can't bear to shrink down. So I'll print them all at 6x4 and scrap one or two at that size. The rest can go in 6x4 divided page protectors so that I can still enjoy the full-size effect in my album. When I've got the pictures and I'm good to scrap, it's nice to work out what colours are really going to work. With the last night, we dress up in red white and blue, and it's really easy to pick out and emphasis those colours using patterned paper. This is my page from last year, and I borrowed the union flag motif as well. The grid motif really helped to make the most of the photos; I had just a handful of good ones and the grid made it simple to incorporate them all. Then I scrap! I often don't have an idea in mind, I just go with the photo and see what works. And what works for me is usually quite a lot of shuffling about bits of paper with the photo and wondering whether I can fit all the journalling in that space or not. So, with this process in mind, I need to get my favourites printed and set aside some crafty time for this week. Fingers crossed! It's Learn Something New Every Day time again! This year I am going to do a tiny album. Last year, I did 12x12 and tried to move house at the same time. Error. But fun trying! And I managed about 2 weeks solid, a page a day, and then intermittent contributions after that. Two and a half by one. I picked this up a few years ago in Leeds, and I am going to use it to note down my learn-something-news each day. And stick in some index print sized pics. Then scrap the ones that turn into bigger pages once and for all. This totally works for me as a non-minibooker. I never feel like I have enough space in a mini to journal and say everything I want to. If I want to scrap it, I want to do it big! And I like all my pages together. So I think this might be a good compromise. In between dreaming up LSNED ideas, I am working on my Masters (yuck). On the bright side, there is probably a lesson to be learned there. I am also remembering my lovely week. I've squished in the London Aquarium, Doctor Who, sleepover and pizza with the friends (hey friends, whats up? ), made and posted all the little embellishments, picnicked up London style in Hyde park, and paddled in a fountain. Twice. And I also went to the South Bank and enjoyed the pretend beach - it's totally cute with sand and beach huts and buckets. Couldn't see any spades though. So I treated myself to an imaginary beach dinner (the beach was imaginary, not the dinner. Imaginary food is slimming but not very filling), sitting outside in the not-quite-cold and watching the world go by while scoffing delicious yummies and reading Lord Peter Wimsey's latest exploits. Then I went to Foyle's, London's most awesome bookshop and held tightly onto my money with both hands and didn't buy any books. I popped to the iMax - HUGE- to see Harry Potter vanquish Voldemort (yay!) in 3D and went to see Legally Blonde the Musical. Again. Actually, it was my third time. In London. I also went once on Broadway. Ahem. But's it's SO CHEERFUL. But my favourite thing of all? Hands down, seeing Much Ado About Nothing. David Tennant and Catherine Tate were terrific, the comic timing exquisite, and the whole thing was so slick and perfect. I laughed so hard I could scarcely catch my breath and I am feverishly trying to work out if I can go again. Quite possibly the best night at the theatre I have ever had. What have I learned? That with a little bit of planning, and a touch of spontaneity, and a working knowledge of how to bypass the closed bits of the Underground, you can fit a lot in in London in 5 days. I've also learned that I LOVE the summer holidays and I would like some more please. But I knew that already. P.S. Maybe another lesson should be that if I splatter mist onto things over the sink, it doesn't go over my clothes, furniture and flat. Just a thought. P.P.S. Why has this only occurred to me today? I first bought some mist, like, a year ago? P.P.P.S. I hate my masters. Hence the eternally long post. P.P.P.P.P.S. Just kidding :D I have to be kidding because I am the kind of person that always reads little unrelated things at the bottom. Or those funny little numbers you get in books that refer to footnotes at the back of the book which reference reference books that you will never read. P(x6).S. In fact, if I write 15000 words on this post, I could just submit this, and forget the masters. And hope no one reads it. P(x7).S This is probably unlikely. Shame.